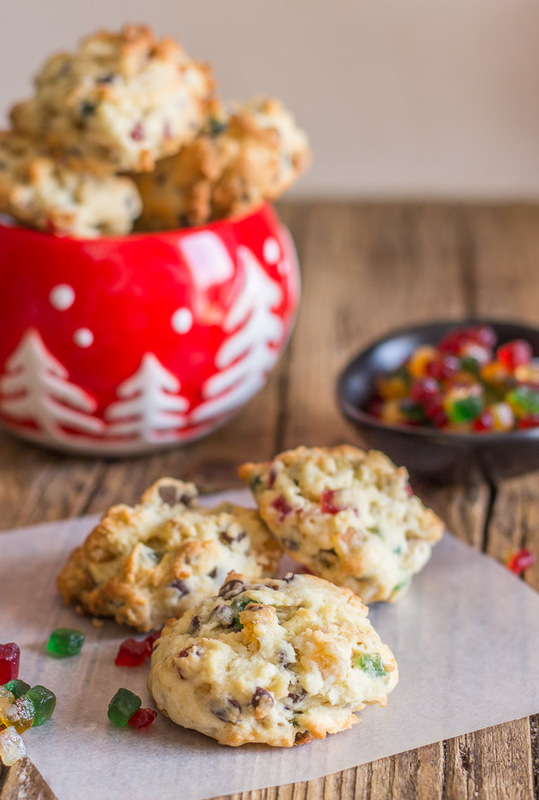 Fruitcake Cookies, a delicious Christmas Cookie, filled with chopped nuts, candied fruit and chocolate chips with a subtle Rum flavouring. 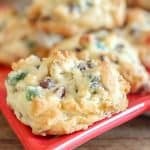 are a fast and easy Drop Cookie. Well since today is November first I figured it was ok to start sharing Christmas Cookies! I love making them and eating them. And so does the rest of my family and friends. Lately whatever sweet recipe I make I hear the Italian saying “you know what would be perfect”? “No what”? “Candied Fruit”. No matter what I make, candied fruit would always make it better! More Christmas Cookies that you may Enjoy! So I decided I would make my husband happy and make him a cookie with lots of candied fruit. This is actually one of my Mom’s Christmas Cookie Recipes. But to tell the truth I am not a lover of those tiny sweet things. So I decided to add some nuts and chocolate chips and of course a little Rum flavouring. They make about 30 cookies, so before we could eat them all, I shared some. My sister-in-law who does not like candied fruit whatsoever, told me she ate most of them before anyone could get to them. Enjoy! 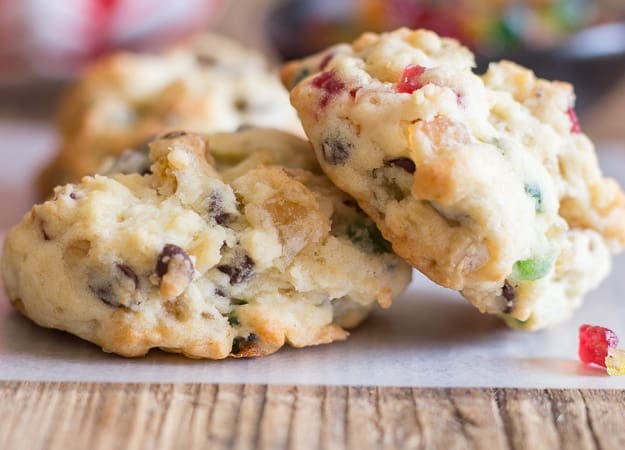 Fruitcake Cookies, filled with candied fruit, chocolate chips and nuts, the perfect Christmas Cookie recipe. An easy holiday dessert. Pre-heat oven to 350°. Line 2 cookie sheets with parchment paper. Beat together sugar and butter until light and fluffy, then add the egg, orange juice and rum extract. Beat for two minutes. In a medium bowl whisk together flour, baking powder, soda and salt, then stir in candied fruit, chocolate chips and nuts. Add flour mixture to creamed mixture and stir to combine. Drop by spoonfuls on prepared cookie sheets. Bake for 10-12 minutes or until slightly golden. Let cool on pan for approximately two minutes then move to a wire rack to cool completely. Enjoy! Hi Steve, I always bake them then freeze, although you could do either. I bake then let them, then let them cool completely and place them in an airtight container or freezer bags. Unbaked you should freeze on cookie sheets and then place in an airtight container or bags. Hope that helps. Greetings from Malaysia. I just saw your recipe and I’m so so so eager to try them out. Oh and just to let you know…. it’s gonna be my first time baking something. 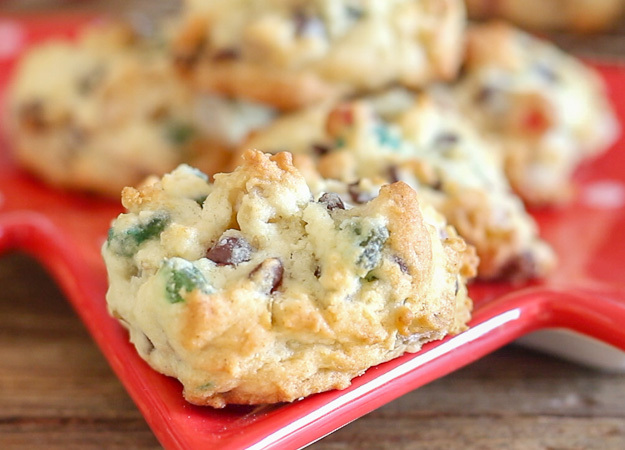 If I wanna do some twist in your original recipe like making them into a chocolate fruitcake cookies… What should I do? What should I change/ substitute? 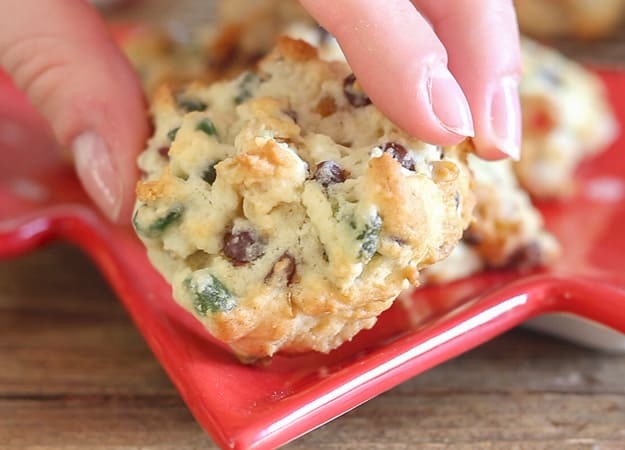 Hope you can help me with this…..
Hi Grace, I’m so glad you chose these cookies as your first time baking, since it is the first time I would do the recipe as is and seeing how that goes then you could change the flour to 1 1/4 cups and add 2 tablespoons of cocoa. Let me know how it goes. Have a great Sunday. These cookies look amazing. I am not a big fan of candied fruit, these just might change my mind.I am going to make them. I hope you stop by Thursday Favorite Things since you are being featured. Hi Beverly, thanks so much and I think they might just change your mind too! Thanks! I will make them today!! !